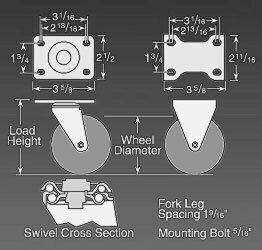 • Top Plate: 2-1/2" x 3-5/8"
• Bolt Spacing: 1-3/4" x 2-13/16" to 3-1/16"
Medium duty high performance caster at economical prices. These caster is built tough for the demands of moving dollies, service carts, stock carts and any material handling job. The unique TPR wheel rolls quiet, is non-marking and resists cutting and tearing associated with other TPR wheels on the market. Wheel brakes, total lock brakes and rigid models available.